The collective noun for a group of jellyfish is a smack or a fluther. But when the creatures come together in large groups, often in small areas, it’s called a bloom. These blooms drift on the current, forming strange and ghostly clusters that can stretch kilometres through the ocean. Artist Penelope Davis spotted her first bloom several years ago, when she was walking along the beach near her bayside home in Melbourne. Hundreds of jellyfish spent the summer in Port Phillip Bay and, after investigating further, she discovered the creatures were uniquely suited to the warmer, oxygen-deprived waters caused by climate change. “It was quite terrifying”, says Ms Davis, who studied at the University of Melbourne. But she felt an aesthetic attraction to the other-wordly sea creatures. 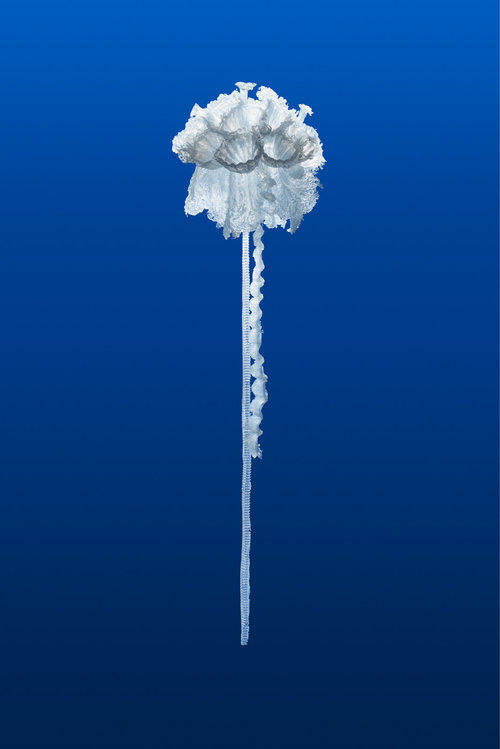 A bloom of jellyfish is a natural occurrence, the result of changing ocean currents, seasons or the availability of prey. In recent years, however, some scientists have wondered whether jellyfish numbers are growing – and whether a warmer planet means more jellyfish. Scientists are still unsure, but Ms Davis was struck by the imagery of a bloom as an evocative illustration of what oceans could look like on a planet ravaged by climate change: bodies of water congested with ethereally beautiful but poisonous animals. That is the inspiration for Sea-change, Ms Davis’ latest work, which debuted last month at the MARS Gallery in Melbourne as part of the continuing festival Art+Climate=Change 2017. The festival was convened by the not-for-profit organisation CLIMARTE, which aims to use art to spark discussions about climate change, bringing together artistic and scientific communities for exhibitions, talks and other public programs. 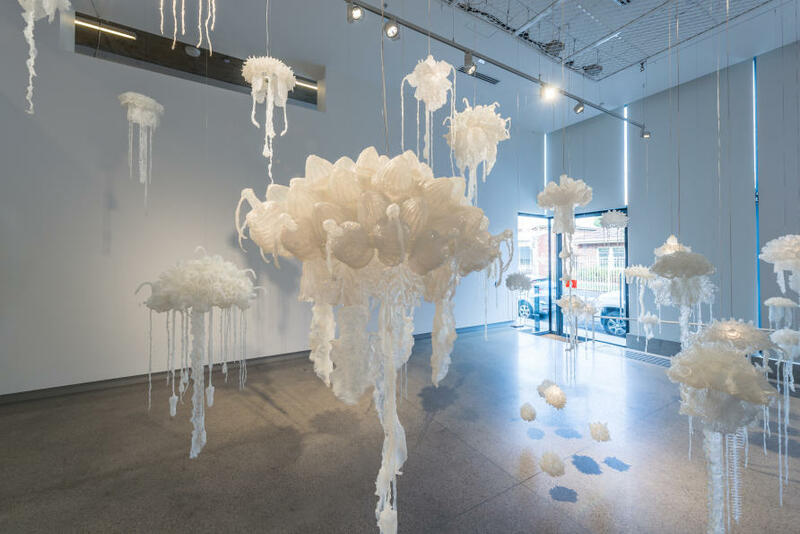 For Sea-change, Ms Davis collected discarded plastics and other ephemera, cast them in silicon moulds and hand-sewed the pieces together into 46 creations designed to resemble jellyfish. Suspended from the ceiling, they look just like a bloom, delicate and eerie, floating beneath the surface of the ocean. Look closer, however, and you will recognise the shapes of the components: tap heads, plastic tops off tomato sauce bottles, mobile phone chargers, camera lenses, fishing lines and other castoffs that recall consumption, consumerism and waste. 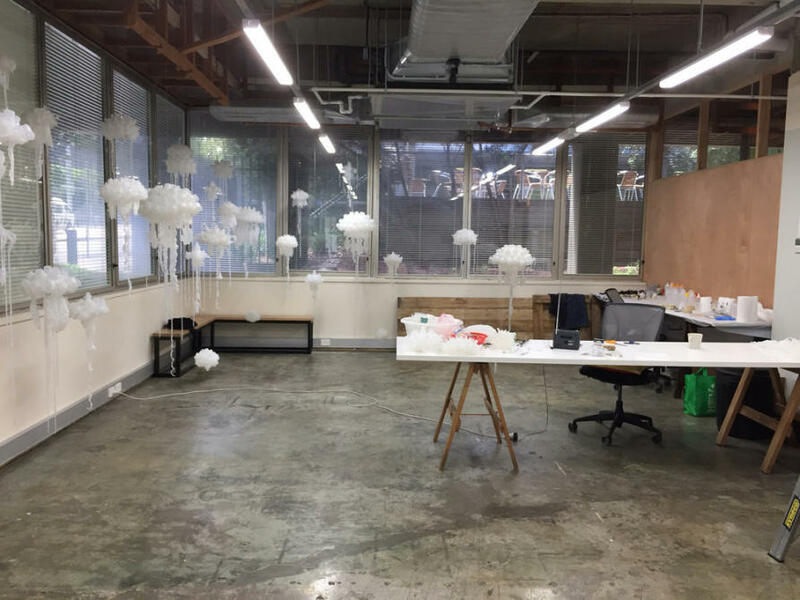 Ms Davis says she did not set out to explore climate science in her work, but it was the natural by-product of her three-month artists’ residency last year at LAB-14, a hub of studios and working spaces for creatives, engineers, researchers and start-ups in the Carlton Connect innovation precinct which is anchored by the University of Melbourne. Ms Davis says LAB-14 had a buzzing, purposeful atmosphere that was an inspiring contrast to her artists collaborative in St Kilda. “I’m usually surrounded by a bunch of other artists and we talk a lot about the Melbourne art world. To go somewhere where that’s totally irrelevant and there’s all these enormous issues that people are working on, it really made me step up,” she says. Ms Davis says she would meet with the building’s other residents to explain her jellyfish, and to engage with them on the issues underpinning the work. She even asked for some of them to contribute their scraps to her project. Carlton Connect was designed to produce such interactions, says Dr Renee Beale, the precinct’s Creative Community Animator. Dr Beale sees herself as the bridge between people of different and often segregated disciplines, such as art and science, in the hope of forcing new conversations about the world’s biggest problems. She connects scientists with artists who might need research to inform their art. The people behind the Carlton Connect project believe that real innovation and solutions come from these interactions. A new Science Gallery, set to open there in 2018, will regularly host exhibitions that use art to help visitors engage with science. Dr Beale also curates exhibitions, such as last year’s Absolutely Famished, which brought scientists, food experts and artists together to talk about future food trends, including robotic farming and 3D food printing. “We recognise the importance of the creative arts in opening up new ways of thinking,” she says. Dr Beale says many scientists are interested the emotional power of art to prompt action on research and data that isn’t always inspiring in its raw form. Dr Peter Christoff, a CLIMARTE board member, has spent much of his career communicating the intricacies of scientific data – to politicians when he worked on the Victorian Ministerial Reference Council on Climate Change Adaptation and to students as an Associate Professor of Climate Politics and Policy at the University of Melbourne. “The challenge has been trying to represent the information and also the arguments behind climate change in ways that are extremely accessible,” he says. “Not only accessible intellectually but also accessible emotionally. Dr Christoff says the public is tiring of conversations about climate change if the same facts and images are repeated over and over. It’s important, he says, for artists such as Penelope Davis to think of new ways to connect people to the dangers of climate change. “She’s created this extraordinarily beautiful and menacing future world that is the product of all our misdemeanours,” he says of the artist’s jellyfish bloom. Ms Davis says she started to think about ways artists could work with scientists during her residency at LAB-14, noting that a lot of their research goes unnoticed by the public. “I think science has this problem, they’ve known all this calamitous information for an awfully long time. But it’s very hard for them to communicate it in a way that doesn’t overwhelm people and make them shut off,” she says. A good communications strategy is an imperative for climate scientists, who are alarmed by apathetic attitudes to a warming planet. 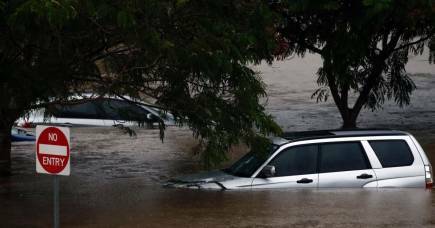 “Climate change is not really a scientific issue any more, it’s a public issue,” says Professor Ary Hoffman, leader of the Hoffman Group at the University’s Bio21 Molecular Science and BioTechnology Institute. He studies the ways organisms adapt to environmental change. “How do we convince the public to take it seriously?” he says. “How do you make it meaningful for people so they take action, and at the moment, we are not seeing action being taken. Professor Hoffman, who uses works of art to emphasise points in his lectures, does believe that good art has a place in the scientific community. 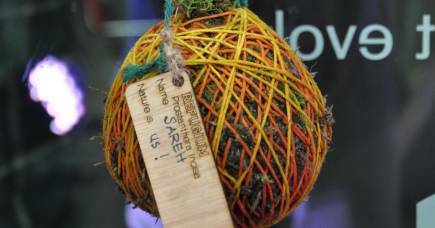 Dr Beale, of Carlton Connect, believes art and science should inform one another, a connection she hopes to encourage at LAB-14. It is there that a sculpturist might work alongside a 3D printing company, or a virtual reality designer alongside a painter. “The idea of having artists juxtaposed with scientists means you have two very different ways of thinking coming together and when you have that, often new ideas spring from that,” she says. EXIT puts the displacement of peoples, and Australia’s own refugee policies, into a daunting global context. 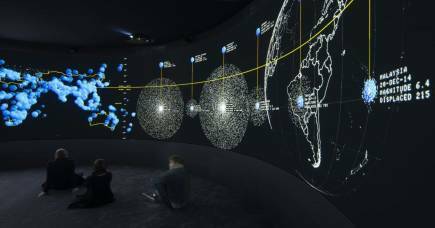 But the installation’s ‘thunderous’ data on loss and climate is empowering.